As the leaves change color and the cooler air comes blowing in, it means one thing, fall is officially here. Which means it’s the perfect time to cozy up inside and start decorating for fall and the Thanksgiving holiday. There are many fun and easy DIY no-carve pumpkin decorating projects that will look great in your home and be perfect at the table for Thanksgiving dinner. One of the best items you can decorate to show off your creativity and love for fall is a pumpkin. These versatile and affordable craft items pair perfectly with Real Milk Paint. Our experts have created this list of pumpkin decorating ideas that do not require carving. When it comes to adding some color to your decorations, nothing works better than Real Milk Paint – it’s safe, easy to clean, and fun for the whole family. What is Real Milk Paint? A whole new way to add some color to your life. Real Milk Paint is nothing like your traditional paint options you find at your local paint or home improvement store. 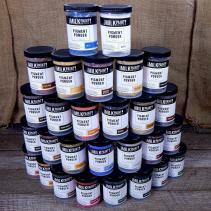 It is a powdered, environmentally friendly and non-toxic paint made from 100% organic materials. It’s safe for both kids and pets and will give you a beautiful matte, velvet, or chalky finish, plus sticks to a majority of surfaces without any priming or sanding. Our exclusive formula is designed to last longer than any other paint products on the market. It’s easy to use and great for all your holiday DIY projects and any painting needed around the house. One of the best parts about Real Milk Paint is that you can create a variety of vibrant colors to help design your pumpkins. We found some of the best Fall pumpkin designs from users who have had some fun using Real Milk Paint that you can easily create yourself. Check out these amazing designs and get inspired to paint a pumpkin that’s perfect for you. Madi used Real Milk Paint to add a ton of color and some shiny finishes to her pumpkins. Don’t be shy to add some sheen, glitter, natural crackle, or some of our other finishing creams and glazes. I made these easy painted fake pumpkins back in 2012 and they are still one of my favorite projects to date! Good Housekeeping included them in their top 35 pumpkin painting ideas for a colorful Halloween post on their website! Search DIY chevron pumpkins on my blog to find the tutorial. Take a look at these perfect Real Milk Paint chevron pumpkins from @mysweetsavannah. She was even nice enough to show you how to design your own on her blog. Check it out and get painting! Check out how Karen used Real Milk Paint to get these adorable “candy corn” pumpkins. And the best part, it’s super easy to design yourself. If you’re looking for some sweet tablescape ideas, see what our friend @desertdecor did with a little help from Real Milk Paint. You too can get these beautiful designs by picking your favorite colors and using different finishing glazes to add some variety. How cute is this pumpkin tower tablescape from @clareandgracedesigns? She chose some beautiful Fall colors and finishes to really show off the texture of the pumpkins. You too can have a tablescape that looks this beautiful by choosing from our large selection of Real Milk Paint colors and finishes. Our friends at @southern.farmhouse.family took multiple pumpkins and covered them perfectly with a variety of vibrant colors from Real Milk Paint. This is a great way to incorporate attractive fall colors and pumpkins into your tablescape this Thanksgiving. Get Started with your Fall Pumpkin Painting Using Real Milk Paint! The DIY Fall decorating and design ideas are endless when it comes to using the friendly and safe Real Milk Paint. These Instagram posts are just a few great examples of how using Real Milk Paint can get you incredible pumpkin designs both for the home and for the Thanksgiving table. Real Milk Paint offers a large selection of color, finishing oils, finishing creams, pastes, and waxes to get a design that will truly stand out this Fall and holiday season. Stay in the know by joining our mailing list! Submit your project for the chance to be featured on Real Milk Paint's blog and social channels!